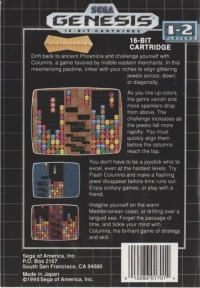 Box Text: Drift back to ancient Phoenicia and challenge yourself with Columns, a game favored by middle eastern merchants. In this mesmerizing pastime, tinker with your riches to align glittering jewels across, down, or diagonally. As you line up colors, the gems vanish and more sparklers drop from above. 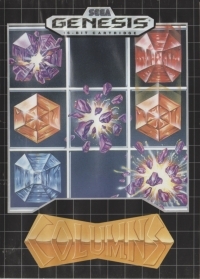 The challenge increases as the jewels fall more rapidly. You must quickly align them before the columns reach the top. You don't have to be a joystick whiz to excel, even at the hardest levels. Try Flash Columns and make a flashing jewel disappear before time runs out. Enjoy solitary games, or play with a friend. Imagine yourself on the warm Mediterranean coast, or drifting over a languid sea. Forget the passage of time, and tickle your mind with Columns, the brilliant game of strategy and skill. 11-15-2012 exonerator Box Text Drift back to ancient Phoenicia and challenge yourself with Columns, a game favored by middle eastern merchants. In this mesmerizing pastime, tinker with your riches to align glittering jewels across, down, or diagonally. As you line up colors, the gems vanish and more sparklers drop from above. The challenge increases as the jewels fall more rapidly. You must quickly align them before the columns reach the top. You don't have to be a joystick whiz to excel, even at the hardest levels. Try Flash Columns and make a flashing jewel disappear before time runs out. Enjoy solitary games, or play with a friend. Imagine yourself on the warm Mediterranean coast, or drifting over a languid sea. Forget the passage of time, and tickle your mind with Columns, the brilliant game of strategy and skill. This is a list of VGCollect users who have Columns in their Collection. This is a list of VGCollect users who have Columns in their Sell List. This is a list of VGCollect users who have Columns in their Wish List.